Prices for laser hair removal vary depending on the area to be treated and the number of treatments you need. Our pricing can be found here. Laser hair removal will save you significant time and money over the long term as compared to many of the other hair removal methods. Laser hair removal uses pulses of laser light to permanently reduce unwanted hair with a series of treatments in the majority of cases. It is the most comprehensive, permanent hair reduction solution available. Other hair removal methods are temporary such as shaving or waxing and need to be done frequently. Depending on the individual shaving may need to be done daily and can cause painful ingrown hairs. Waxing or sugaring needs to be done approximately every 4-6 weeks or so which can be expensive over the long term. The technology used in laser hair removal uses a laser beam that emits light at a specific wavelength that directly targets melanin in the hair follicle, without damaging the surrounding skin. Within the follicle, the light energy is then converted to heat energy to destroy the follicle and stop the hair from growing again. Any individual who wants to permanently reduce unwanted hair on their face or body through laser hair removal treatments should have a laser consultation with a certified laser technician to discuss whether this treatment is appropriate. The newest laser hair removal technology has improved to the point where it is generally effective for all skin tones, most hair types and colours (individual results and experiences may vary). Unfortunately though not everyone is a good candidate. Our diode laser can treat all skin colours however lighter coloured hair; blonde, grey, white or red generally gets poor to no reduction and the thin fluffy hair (mostly on the face), even though dark, is also unlikely to have good results. Some blonde hairs do have dark roots which would be good candidates for laser hair removal. There are also many contra-indications to laser which mean you can’t be treated, e.g. pregnancy, taking medication that increases the skin’s light sensitivity such as Accutane and many others which will be discussed at your free consultation. I have a darker skin tone, can I still get the treatment done? The Venus Velocity laser hair removal treatments can be done on darker skin tones. A technician will perform test spots (at a free laser consultation) to ensure no skin discolouration or sensitivity and wait 48 hours before assessing the results and if applicable proceeding with an individualized treatment plan. Why do I need a consultation first? Everyone must have a free 20-30 minute laser consultation prior to receiving any laser treatment. Even if you have had laser hair removal done before it may have been a different machine or even with IPL. We will need to do test spots with our Venus Velocity. This consultation is where we will assess your suitability for our laser and give you feedback as to what we think we can do for you. Your medical history will be reviewed to check you are medically suitable. (Bring along a list of any medication you are taking) and fill out our First Visit Laser Consultation medical questionnaire and the Informed Consent booklet. We will also attempt to email out a copy of this to you in advance. The treatment area and type of hair growing in the area will be checked. We will discuss any concerns, expectations and goals and will work with you to select the best treatment or combination of treatments. The estimated duration and cost of each session or series of sessions will also be provided to you. If you are a candidate for laser hair removal, you may schedule your treatments (after 48 hours) at the time of this initial consultation. Most clients will require around 6 treatments per area though some will require more. The exact number will depend on each individual person’s skin type, hair color and texture, and the area being treated. Laser hair removal treatments are most effective at destroying the hair follicle when it is in its active growth stage (anagen) as follicles do not contain enough pigment (melanin) to be neutralized during other phases. Since each hair can be at a different stage in the cycle, several treatments must be performed to effectively target the majority of hair follicles in the treatment area. The amount of time hair is in growth phase (anagen) is different in different parts of your body, e.g. on your head 2 or more years (thus longer hair), on your face 4-6 weeks, body and legs 6-8 weeks. The period of time hair is in the anagen stage is used by us to determine how many weeks between each laser treatment (so we get the maximum growing hairs each treatment). Do I have to be a certain age for laser hair removal? Yes, due to hormone levels that can change rapidly in adolescents that can cause new hair growth. This could lead to varying results in younger clients. For this reason we do not perform laser hair removal treatments on clients less than 16 years old to ensure effective, lasting results. Why laser instead of IPL for hair removal? 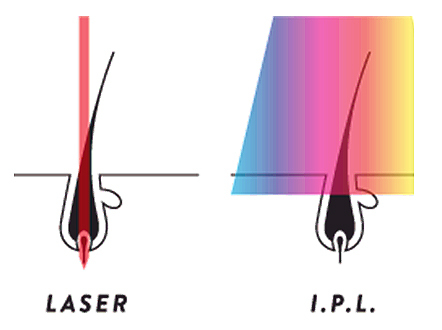 IPL is very commonly and mistakenly referred to as a “laser”. IPL stands for Intense Pulsed Light and it is a broad spectrum light that spreads over the whole treatment area. IPL has a wide range of uses and is generally well suited for skin rejuvenation treatments. It has a much shallower skin penetration compared to a diode laser. Laser stands for Light Amplification by Stimulated Emission of Radiation. It is a medical grade optical electronic device that generates an intense (very narrow) beam of single wavelength light that selectively targets melanin in hair without damaging surrounding skin. Diode hair removal lasers provide focused and more concentrated light energy that can penetrate deeper to better reach more hair follicles. This provides better hair reduction and long lasting results than IPL. Can I get laser hair removal done over a tattoo? No. The laser will cause the pigmentation in a tattoo to heat up. This would ruin the tattoo and could also burn your skin. You could do laser hair removal before you get a tattoo in a specific area. It depends on the size of the area being treated. Small areas like the upper lip can be done in 15 minutes or less. Larger areas like full legs could take around 45 minutes. What does the treatment feel like or is it painful? Some clients experience slight but manageable discomfort and others do not. It depends on the area being treated, the amount of hair in the area and your sensitivity. Some areas such as bikini or upper lip can be more sensitive than others. Once the treatment starts, you’ll feel some heat in the area, but this will only last a short while, thanks to the Venus Velocity’s real-time cooling system to minimize discomfort. If your technician is using PULSE mode, some patients say it will feels like a light snap of an elastic band against your skin. If they’re using SLIDE mode, it will feel like a series of lighter snaps as the technician glides the applicator continuously across the treatment area. Most clients find this mode virtually pain free. If you are experiencing pain please let the technician know so they can make adjustments. For those who do have sensitivity we also sell a numbing cream that can be applied before you come in for the treatment to further reduce your discomfort. This is also used by some of our waxing clients. Your technician will provide exact instructions for your specific case at the laser consultation. Typically, we advise clients to shave 12-24 hours prior to treatment. If you do not shave the area we will charge you an additional fee to do so. Refrain from any other hair removal method other than shaving (such as waxing, sugaring, threading, tweezing or depilatory creams) for six weeks or tanning 2 weeks prior to treatment. On the day of your treatment do not wear makeup, lotion (other than numbing cream if desired), or deodorant on the area to be treated. After treatments, hairs will appear to grow as if they were never treated. These hairs will exfoliate or push out in approximately 1-2 weeks. This process tends to make the hairs appear to grow faster the first week after treatment. This is simply the hair that was damaged by the laser treatment being extruded. Do not remove these hairs; let them fall out on their own. One-week post treatment you may use a loofah sponge gently on your skin to assist in the exfoliation process. After one week you may also shave between treatments, but do not use any other method such as sugar, wax, tweeze, thread, or depilatory creams for hair removal. Your results will typically continue to improve following each treatment. We will provide you with a treatment schedule to maximize your results for the area being treated. We will provide you with a post care pamphlet so you have the information on hand. You may feel like you have a slight sunburn around the treatment area which is erythema and edema (redness and swelling), but this should fade away after 1-2 days at the very most. Over the counter Hydrocortisone, Vitamin E and/or pure Aloe Vera Gel (without alcohol) may help to decrease redness or inflammation and may enhance healing. Some clients may also experience what appears to be a rash accompanied by some mild itching. This is also normal—it’s just the skin’s response to the energy. Post procedure laser balm or gel such as those from Elta MD may also be used and are currently available for purchase from Spa Olivia. You may also see some hairs fall out more easily in the days following your treatment—this is perfectly normal. Do not scrub the area to get the hairs to fall out quicker as this could make you more susceptible to infection. Wear a broad spectrum SPF-30+ sunscreen for at least a month following treatment to protect the skin even on cloudy days. After one week you may shave between treatments, but do not use any other hair removal method such as sugar, wax, tweeze, thread, or depilatory creams for hair removal. Post treatment discomfort is normally mild and you may return to regular activities immediately. For the first two days following treatment it is advised that you avoid strenuous activities, sports, swimming, hot baths/showers, saunas, Jacuzzis (hot tubs) and pools (bacteria in them can cause an infection). In most instances, there is significant reduction of unwanted hair in the treated area. 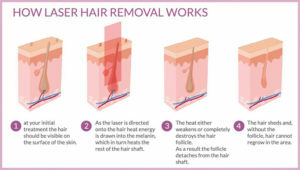 Laser hair removal treatments permanently reduce hair growth though no hair removal treatment is capable of halting all hair growth entirely. Effectiveness of treatments will vary from person to person. Factors such as hair regrowth rates, response to treatment or hormonal changes among other reasons may result in some small patches of hair after a successful course of treatments. While any hair that does grow back in the treated area is often sparse, less coarse, and often unnoticeable, a touch-up maintenance appointment may be needed to maintain results. Some clients may not need or want any maintenance while others may have a maintenance session every 3-12 months or more after completion of the initial course to maintain their results. Will I need to take time off or have downtime after my treatment? Post treatment discomfort is normally mild and you may return to regular activities immediately. For the first two days following treatment it is advised that you avoid strenuous activities, sports, swimming, hot baths/showers, saunas, Jacuzzis (hot tubs) and pools (bacteria in them can cause an infection). If you have any complications such as crusting, avoid any activity that can rub or irritate the area until it’s healed and clear. Make sure you avoid the sun and apply a broad spectrum SPF-30+ sunscreen for at least a month following treatment to protect the skin. Make sure you avoid the sun and before going outside apply a broad spectrum SPF-30+ sunscreen for at least a month following treatment to protect the skin. For the first two days following treatment it is advised that you avoid strenuous activities, sports, swimming, hot baths/showers, saunas, Jacuzzis (hot tubs) and pools (bacteria in them can cause an infection). You should also steer clear of massages, or any treatment that requires direct contact with the skin for the first 2 days after your treatment. I had a treatment on my face, can I put makeup on right after? We recommend that you do not put on makeup for 48 hours as many contain alcohol or talc that could react with your treatment. Make sure you do put on a broad spectrum SPF-30+ sunscreen.